(A selection). The future of shape selective catalysis (S.M. Csicsery). Pillared layered structures (PLS): From microporous to nano-phase materials (R. Szostak, C. Ingram). Powder X-ray diffraction and solid waste NMR techniques for zeolite structure determination (G.T. Kokotailo et al.). New aspects and trends in zeolite catalysis (J. Weitkamp et al.). Covalent interactions in zeolites: The influence of zeolite composition and structure on acid softness and hardness (A. Corma). Author index. Subject index. ZEOCAT '95 is the eleventh in the series of symposia devoted to special fields of zeolite chemistry. Six plenary lectures, forty oral and forty-two poster presentations were included in the program. 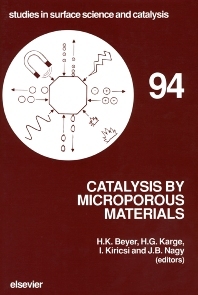 The accepted papers cover every aspect of catalysis on microporous materials. A significant number of the contributions describe the synthesis, modification, instrumental and chemical characterisation of zeolites and other micro- and mesoporous materials. Catalytic reactions involve hydrocarbon cracking, nucleophilic aromatic substitution, methanol to hydrocarbon conversion, hydration of acetylene, various alkylation reactions, redox transformations, Claisen rearrangement, etc.